The radon guideline level for Canadian buildings has been reduced to a 1/4 of what it used to be. Buildings that once were considered to not be at risk to radon levels may now be exceeding guideline levels. Call us for more info. Theodor Sterling Associates is a multi-disciplinary consulting firm providing indoor air quality, environmental and a variety of occupational hygiene & safety consulting services to clients in Canada, the United States and South America. 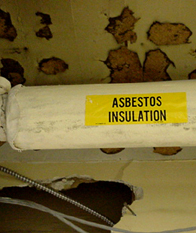 The company's main area of expertise is indoor air quality and mould investigations but the recent addition of new team members permits us to professionally conduct asbestos surveys, develop asbestos management programs, conduct worker exposure assessments for a variety of workplace contaminants and help you meet the requirements of various health and safety regulations. Located in Vancouver, British Columbia, Theodor Sterling Associates has been providing quality consulting and technical support for more than 30 years. Copyright� 2002-2010 Theodor D. Sterling and Associates Ltd. All rights reserved.